Through yoga postures, breathing exercises and meditation practices this workshop is focused on returning to the heart as the source of the mind and the link between earth and sky, mind and matter. Not a course in backbends, but a gentle and deeply meditative physical practice, drawing our attention, breath and prana into the heart center to free it and nourish it. Open to all levels and limited to 8 participants. Se traduisent par des postures ou exercices de souffle spécifiques, nous reviendrons sur le coeur comme la source de l'esprit et le lien entre la terre et le ciel, l'esprit et la matière. rendezvousyoga(at)gmail.com or 06 89 70 23 58. 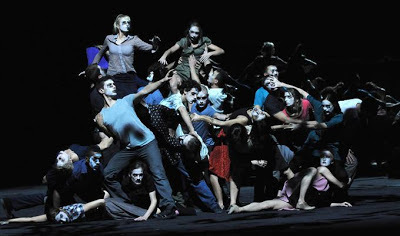 I love Maguy Marin's choreography, or at least, I have in the past, so I was excited to see one of her newer works. The theatre was packed, and the buzz of energy and excitement gave the impression that others felt the same way. 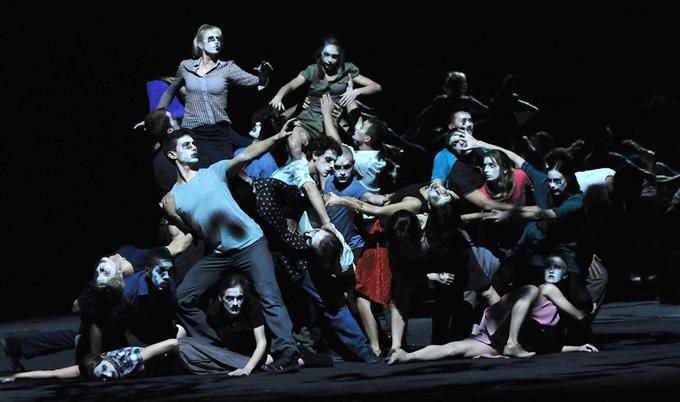 Rumor has it that Lyon Opera Ballet's dancers are fierce. It was my first time seeing them. All I can tell you is that they are wicked costume changers. The speed and agility with which they changed their many, many, many, many costumes was like lightning. The problem was that all motion happened in the dark and all we ever saw was the photographic tableaux in between when they were catching their breath. You didn’t see them panting or heaving though. No sir, not them! The piece started with a giant, slightly warped mirror filling the back of the stage, a lot like what they used for the set of A Chorus Line. Each of the 28 dancers came in one by one by one (okay, sometimes in twos or threes towards the end). They stood staring out at us. I felt as if I had seen this before, a long time ago. It was clever how the video projections created the lighting, but I was frustrated that it was too dark most of the time to really see anything. Admittedly, the reflections against the backdrop created a sense of 'painted space' that was quite beautiful in an abstract way. A book on propaganda was for sale in the lobby; it was labeled as an inspiration for the creation of the piece, but frankly, I just didn't get it. A dancer would take his or her stance, and then do something like putting on a crown, and then very slowly and very simply, one by one by one (okay, twos and threes too), others would join in. But 28 dancers was far too many for this particular formula, especially when there was no dancing and no change in the rhythm or dynamics. The lights were so dark that you couldn’t see what they were doing anyway, and it did not come as a big surprise that a number of people left early. Eight of her works created between 1981 and 2012 are being celebrated in New York City this Fall in conjunction with the Festival d'Automne in Paris (which runs through December 15th). I know at least one of these is a masterpiece, so if you have a chance, do check them out. I'd skip Faces though.